Published in the South Kent Gazette, 3 September, 1980. Dover Castle was held by a company of about 50 soldiers at the outbreak of the Civil War and, on the 21st August, 1642, it was seized by the local adherents of the Parliamentary party, who scaled the slight defences on the cliff side. The Royalists of Kent, under Sir Richard Hardres, with a regiment of foot under Colonel Hammond, of Nonington, and one of cavalry under Colonel Hatton, seized all the forts and castles in East Kent except Dover. They made an assault on Dover Castle from a battery planted on the site of Castle Hill Farm near where the guardroom of Connaught Barracks now stands, but after firing about 500 camion balls into the Castle the Parliamentary forces, under Colonel Rich, dispersed the Royalists and held the Castle until the Restoration. The north-west wall of the Keep would have been the one to receive the impact of these cannon balls and it may be that some of the repair marks on it are associated with this bombardment. Cromwell paid a visit to the Castle when he held the post of Protector and a letter cl his, addressed to Colonel Kenrick, Lieutenant of Dover Castle, dated 18th April, 1648, says, “I expect to hear from you about your defects in the Castle so that you may be timely supplied." Charles II did not make any stay at Dover when he landed at the Restoration; but he spent three weeks at Dover Castle in May, 1670, on the occasion of the negotiation of the Secret Treaty of Dover, which was intended to form an alliance between France and England for the purposes of humbling the Dutch Republic, to annex Belgium to France, and re-establish Popery in England. The treaty was signed at Dover Castle, but Charles II refused to take any steps to carry out its provisions. On the abdication of James II in December, 1688, the Protestants of Dover were alert. Two days before James fled, from London some 300 of the men of Dover assembled in the Market Place. They had heard that there were Irish troops on the road to Dover, and that the French were about to land. The Mayor, Captain William Stokes, urged the men to await peaceably the Issue of events, but the leaders of the assembly determined to march up and take the Castle for William of Orange before the French or Irish intervened. The men who marched were Lazarus Thornton and Matthew Downe (masters of ships), John Knight, Nicholas Boyket (brewer), Joseph Streater (soldier), Joseph Pines and Thomas Taunton (bakers). They, with nearly 300 others, marched up into the Castle, seized it in. the name of King William, and held it until they finally handed it over to Colonel Wickfleld for the King. These men, subsequently, sent a petition to the King asking that, as a recompense for their services, they might be employed in the army or navy, and the reply was that as many as were of the sea should have suitable places in the navy. At that time the Castle was in a neglected state and there were no soldiers in it." The Constable of the Castle then in office was the Earl of Winchelsea, an aged nobleman, who was in charge of the Castle at the Restoration. He was in favour of William and Mary being invited to accept the throne which, no doubt, accounted for there being no opposition to the seizure of the Castle in their name. From the days of Cromwell until the Kaiser war of 1914-18 no hostile gun was fired at or from the Castle. During the American and French wars it was furnished with modem fortifications, and its guns in later times have been modernised; but, notwithstanding these preparations, the old fortress was never in action. Adjacent anti-aircraft defences were in operation, however, to prevent German air attacks on the Castle. 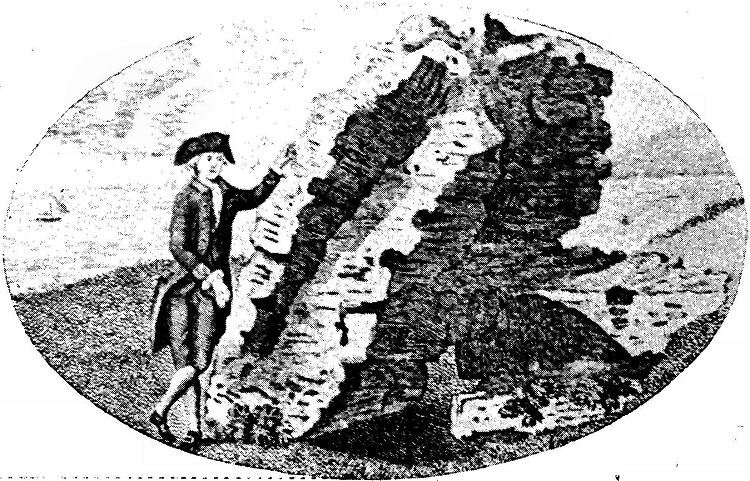 Dover Bay in 1690. A particularly interesting picture in that it gives some idea of the height of the Western Heights Pharos as it existed in the 17th century. 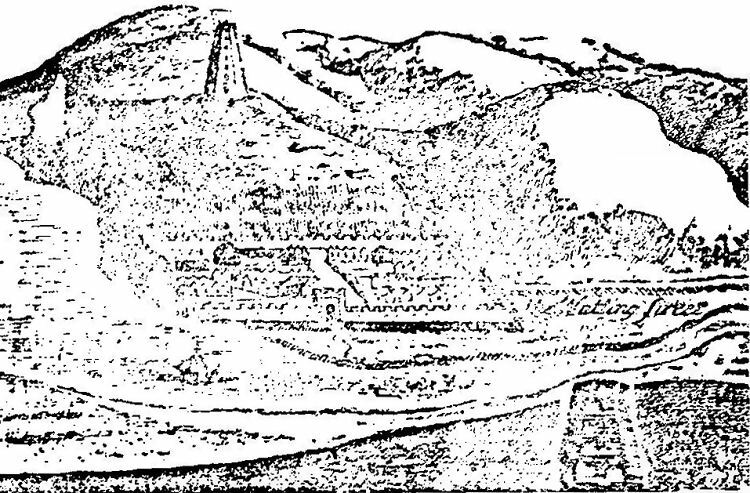 Like its companion at the Castle it is indistinct but in the original oil painting — long in the ownership of the Mowll family — it can be seen on the cliff-top above the sailing ships on the left. 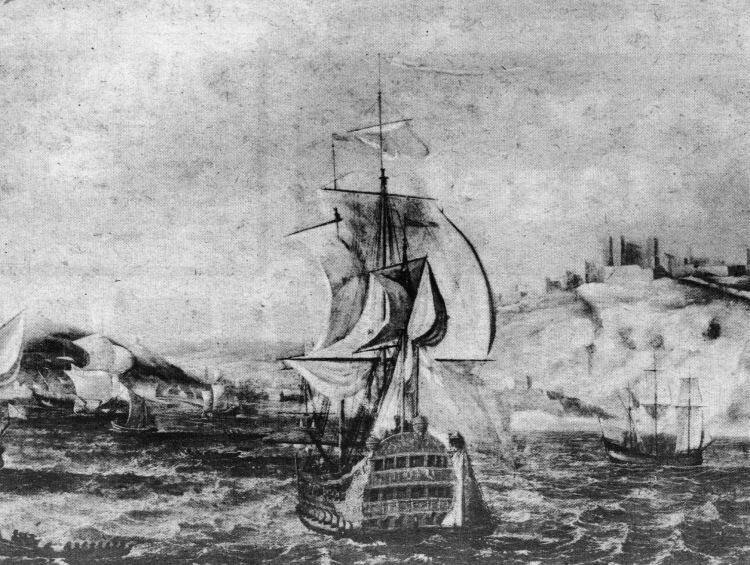 Above is a pre-20th century artist’s impression of the Roman port of Dover. The oval picture depicts the Bredenstone, a fragment of the western Pharos, which was put on view to the public in 1892 after foundations of the tower were found during excavations in the 1860s.